You may recall that task classes (which vM&K say are also known as equivalence classes, problem sets, or case types) are categories of whole-task problems (“learning tasks”) with the same degree of difficulty. A very short training program might have only one task class, though I’m having trouble picturing complex learning that you could accomplish that way. Maybe specialized training for skilled people to increase their ability in a new but related area, like training computer technicians to troubleshoot a new type of equipment. This chapter of the book deals with sequencing task classes, learner support in task classes, and (gasp) part-task sequencing. 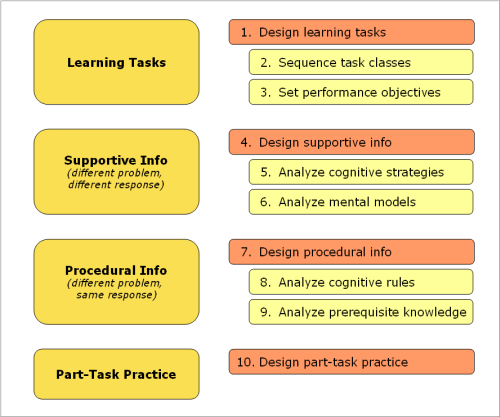 The Ten Steps strongly advocate a whole-task approach to sequencing….on the premise that learners should quickly acquire a complete view of the whole skill that is gradually embellished during training. Ideally, even the first task class refers to the easiest version of whole tasks that professionals encounter in the real world…. This provides learners the best opportunities to pay attention to the integration of all skills, knowledge, and attitudes involved, and to the necessary coordination of constituent skills. vM&K mention “global before local skills,” a principle of cognitive apprenticeship, as well as Reigeluth’s metaphor of a zoom lens. The idea is that you begin with the wide-angle view (the whole task), zoom in for detail (an early task class), zoom out again to see the part in relation to the whole, zoom in on other details, and so on. One way to sequence task classes is to simplify conditions. The learner works with all the constituent skills, starting with the easiest version of the whole task that professionals might encounter. Let’s say the whole task is for an Amtrak reservation agent to answer customer questions about schedules. (As the subject-matter expert here, I’m deciding “schedule questions” is one task class and “fare questions” is another.) Factors affecting the difficulty of the whole task might be the complexity of the route, the firmness of the dates, the available accommodations, and the number of trains satisfying the request. Those factors or dimensions act as a kind of recipe for building task classes. In the easiest class, for example, the learner works with schedule requests where the routes aren’t complex, the dates are firm, there are few accommodation options, and there aren’t many trains to choose from. Another way to sequence task classes is to focus on different sets of the constituent skills in different classes. How’s that different from just teaching parts of the overall task? Because although you’re shifting (or “manipulating”) the emphasis between various constituent skills, you’re still working on the whole task. vM&K give an example of student teachers learning to teach lessons (“teaching a lesson” being the whole task in this example, no matter what you think teachers ought to be doing or not doing). A first task class might emphasize presenting the subject matter. The next task class might involve teaching with an emphasis on questioning; another class, teaching with a focus on initiating and encouraging group discussion. The final class would involve teaching (the whole task), with the idea that the student teachers integrate the skills of presentation, questioning, and discussion. Training for a supervisor in a pharmaceutical plant might have a whole task for preparing an employee to operate the cartoning machine. One task class might emphasize safety; another, standard operation; a third, troubleshooting; a fourth, changeover for different products; a fifth, different levels of cleaning and maintenance. One drawback to “emphasis manipulation” is that it presents the learner with complex situations from the beginning. Remember, you’re not simplifying the situation, only emphasizing certain constituent skills in the context of the whole. This approach probably isn’t a good one for the early task classes of a highly complex task. A third way to build task classes is via the underlying body of knowledge. If that sounds confusing to you, I’m glad to have the company. Analyze any progressions of mental models (pictures of how the domain is organized). Those are Steps 5 and 6 in the model, which means I haven’t read those chapters yet. We’ll get there. In the meantime, you can, of course, combine the types of sequencing. You’ll likely use simplification first because it’s…less complex than emphasis manipulation. Speaking of simplicity and complexity, we’ve still got a straightforward topic (learner support) and a confusing one (part-task sequencing) to deal with in Step 2. We’ll knock off the easy stuff and save the hard part for next time. You’ve probably figured already that scaffolding (diminishing support and guidance) applies within a task class. So if your learning involves four task classes, you’ve got four sequences of scaffolding, each with high support and guidance in early examples, fading to none by the end of the class. For the task class “simple Amtrak schedule requests,” a first learning task might involve a mini case study of someone handling a simple request. The learner would explain what happened to make the response effective. The next learning task removes some scaffolding–for instance, giving a partial response, for which the learner must provide the missing pieces. As a last learning task in the “simple schedule” class, the learner would work what vM&K call a conventional task — given a passenger request, reach the goal. The last part of this chapter deals with “part-task sequencing of learning tasks.” It’s complicated enough that (a) it would make this post too long and (b) I don’t yet know how to explain it. That’s reason enough to leave it till next time. CC-licensed simplified camera photo by John Kratz. CC-licensed lens photo by Anders Ljungberg. My sawtooth image adapted from a CC-licensed leaf-edge photo by P/\UL.